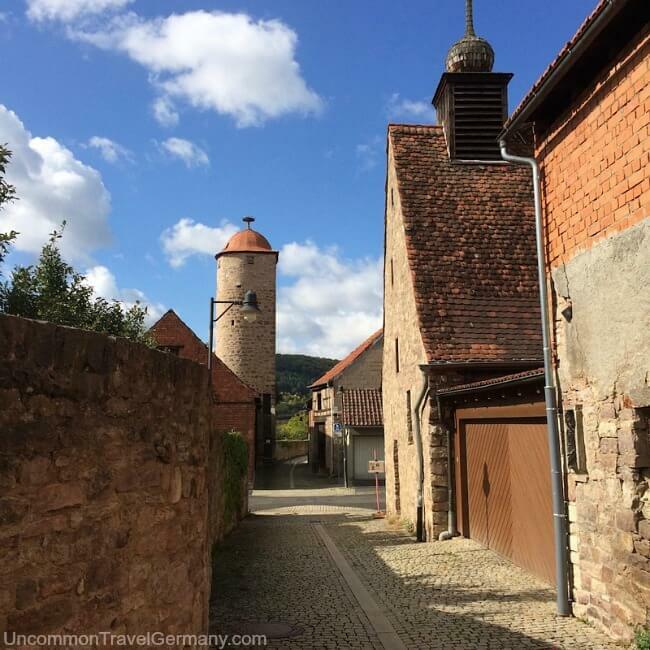 Yes, there really is a Hammelburg! 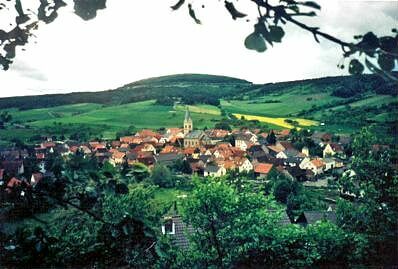 Most people haven't heard of Hammelburg, unless they watch Hogan's Heroes. And that's a shame, because it is a great spot to visit. I decided to take a look at the town, because of my attachment to the TV show. What a surprise! 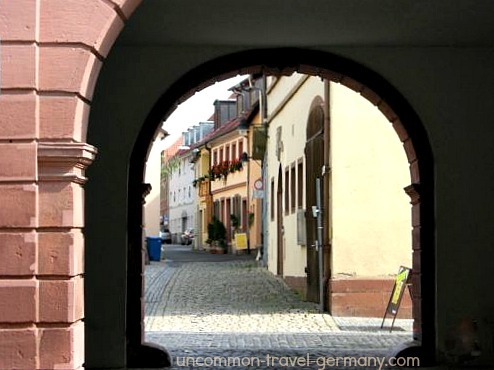 A pretty little town of around 12,000 people, it lies in a picturesque valley in an ancient wine-growing region of Franconia, in what is now the northwestern corner of the state of Bavaria. 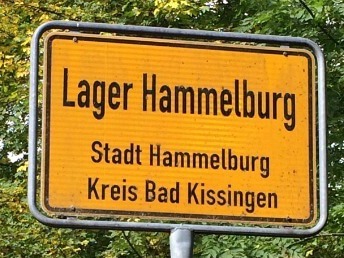 For a Hogan's Heroes fan, the effect of getting off the train at the little railway station and seeing the sign "Hammelburg" is indescribable. 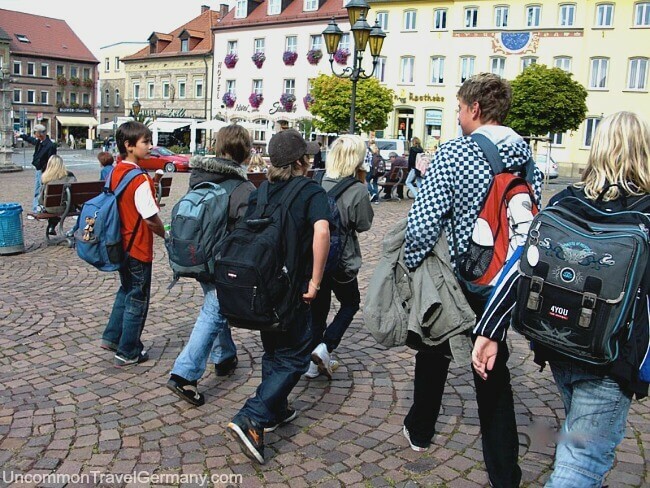 From the Bahnhof, it is a short walk to the town center. The streets are narrow and winding and lead to the Markt, a large market square lined with attractive, pastel-colored buildings. Hammelburg was fortunate during the war; there was no battle for the town and it wasn't damaged. 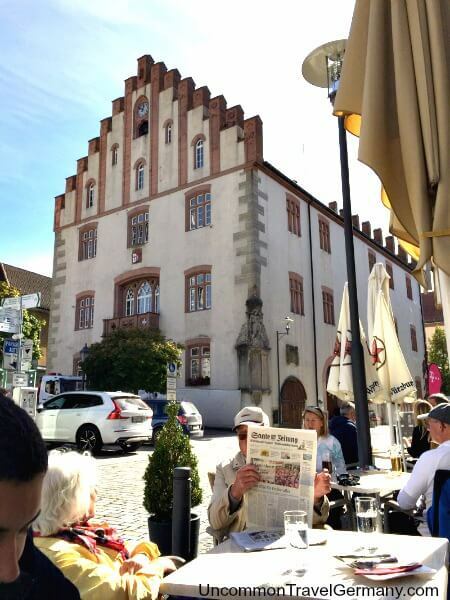 It maintained its old look and now has a mixture of buildings from the Middle Ages through the 20th century, but the general appearance is that of a traditional, older German town. However, there was a fierce battle for Stalag 13 just outside of town a few weeks before the end of the war. A very interesting story (see the raid on Hammelburg). The town itself and surrounding vineyards are very attractive and worth exploring, and anyone with an interest in wartime history will probably enjoy poking around in the camp outside of town. Don't miss the view from the castle! The town has a small cluster of narrow, winding streets, with some pretty squares interspersed. Ancient walls and towers pop up here and there. 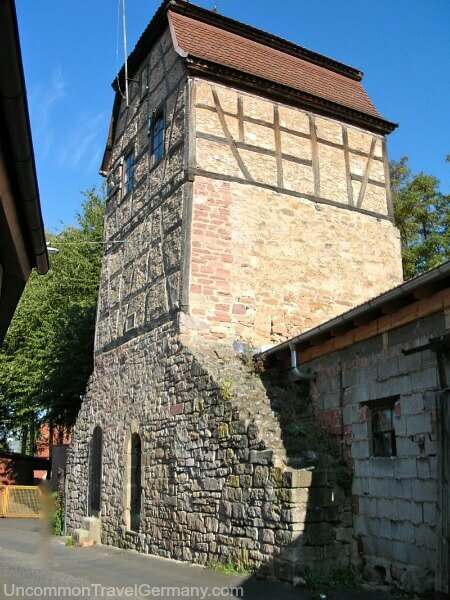 Sections of the town wall and two guard towers date from the 12th century, and the older part of the town has some half-timbered houses built in the 16th and 17th centuries. Several of the churches are quite old as well. 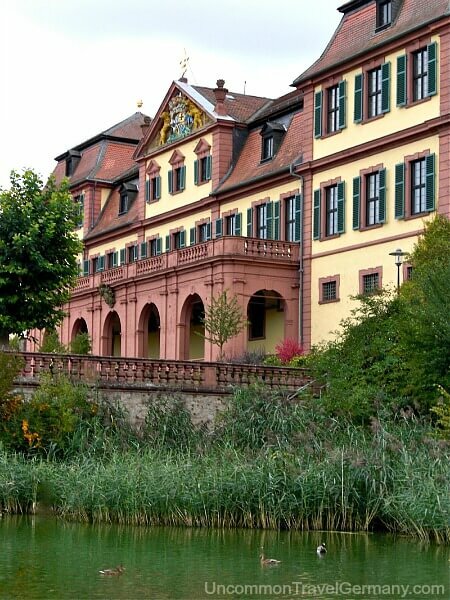 On the western edge of town there is a large 18th century palace facing an ornamental pond filled with ducks. It currently houses the police station and a wine-growers association. The Rathaus on the Markt (Town Square), was built in 1529, then rebuilt after a fire in 1856, and has a distinctive step-like facade. Places to eat on the Markt. The Markt is a pleasant place to hang out. There are a number of places to eat around the square that have outdoor seating in good weather. 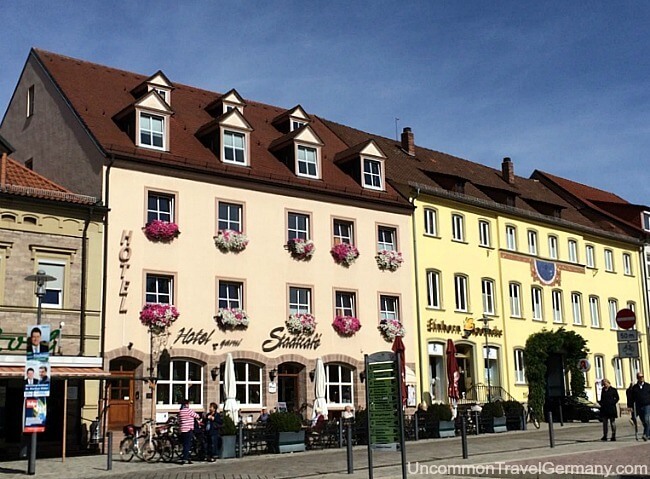 Choose from satisfying German dishes at the Weinhotel Müller, or go for Italian food at Pizzaria Saim, and finish off with dessert at the Hotel Stadtcafe in their ice cream parlor. The Gasthof Zum Hirschen on the Markt has a rustic, gemütlich dining room with hearty German cooking and a jolly crowd of regulars. The Tourist Information Office is in a building across the street from the Rathaus. The staff was very friendly and helpful; they have lots of information about the town, the army camp, and hiking and bicycle trails. I went to the Rathaus to find out about getting onto the premises of Lager Hammelburg, as Stalag 13 is now called. A woman at the city hall was eager to help and accompanied me to the Tourist Office to find out about access to the military installation. 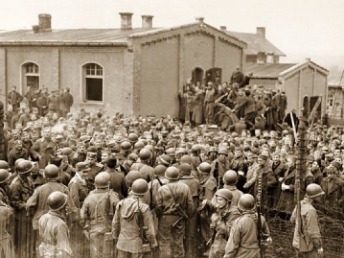 Talking to the camp office, she learned that it was possible to walk through parts of it, though other parts are fenced off as a restricted military area because of the Bundeswehr Infantry School. The prisoners' graveyard was in the accessible area. Outside of town, up a steep path climbing the vineyards behind the hospital, is The Mystery. Some years ago, life-size human sculptures started appearing high on the hill at intervals of a year or so. 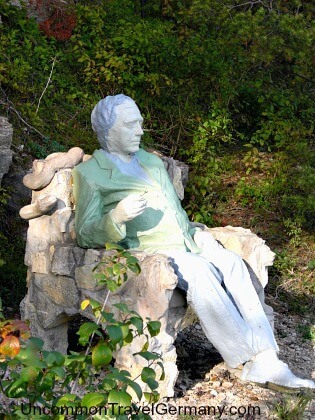 No one knows who made them or why, or how these extremely heavy statues got up there. The figures are those of a man sitting in a chair, a woman dancing with a child, and a woman looking out at the valley. Very strange, but beautiful. The view from that spot is worth the trek to the top. On the road into town from the Bahnhof, there is an interesting museum, Stadt Museum Herrenmühle, about the history of local wine-making and bread-making. 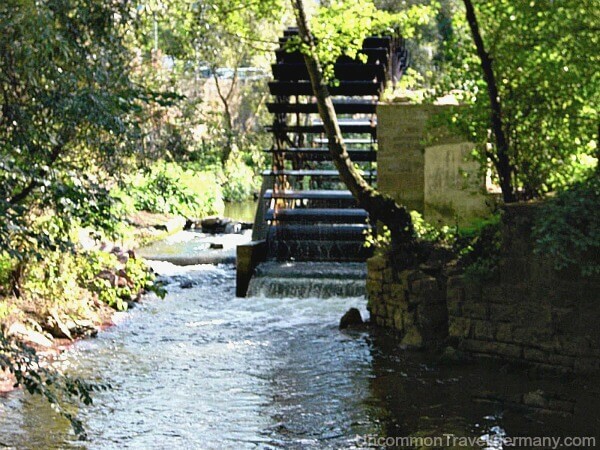 The museum is in an old mill with the stream and mill wheel nearby. Just outside of town high on a hill is the medieval castle of Burg Saaleck. I walked there in about ten minutes and made the steep climb up to the castle. The building is in good shape and houses a reasonably-priced hotel, which would be fun to stay in if you were traveling by car. Plus a restaurant. A winding staircase takes you to the top of the tower and is definitely worth the effort. 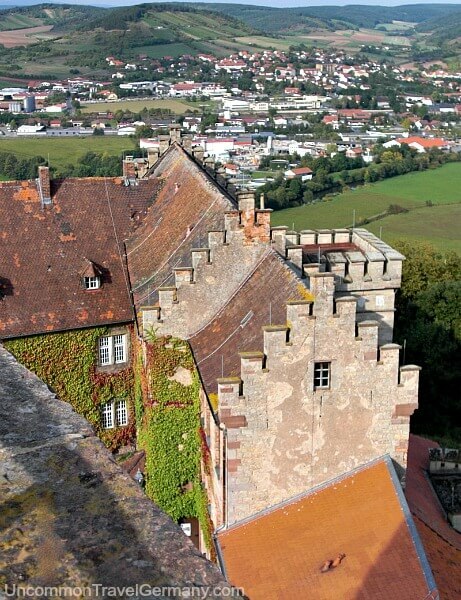 From the tower you can look out at the delightful Franconian countryside and see the town of Hammelburg below. What a view! Aside from exploring the town and the army camp, the area has a wide range of active things to do as well, including hiking, biking, swimming at the huge sports center, and boating on the river. 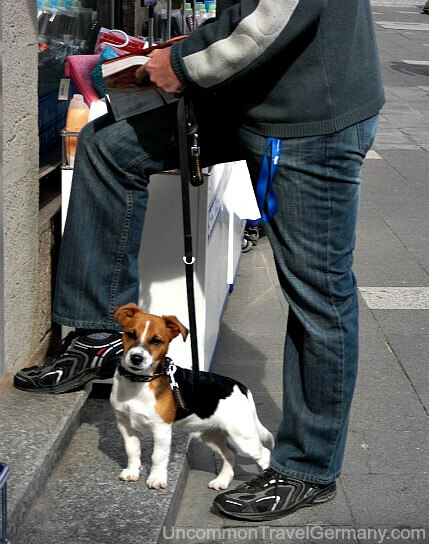 Inquire at the Tourist Office on the town square for more info. 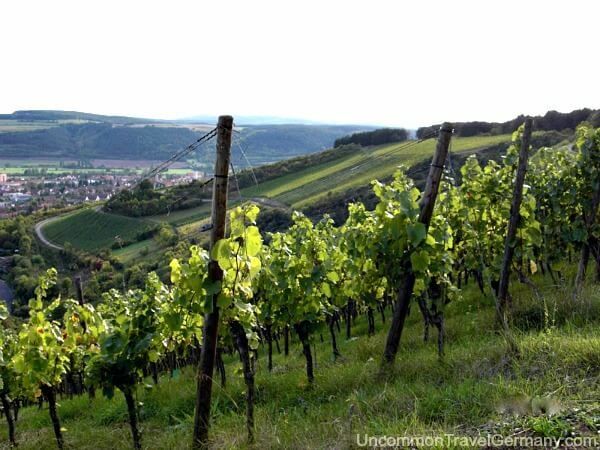 The valley is carpeted with lush farmland and small villages; the steep hillsides are covered with vineyards. It is certainly a lovely area and the white wine was excellent, especially the Bacchus and Sylvaner varieties. There are several winemaker shops in town that sell the local wines, and of course they are available in all the restaurants. Hammelburg is known as the oldest wine town in Franconia; people have been making wine here since the year 777 (or before). The vineyards photos above were taken from the hill with the mystery figures. 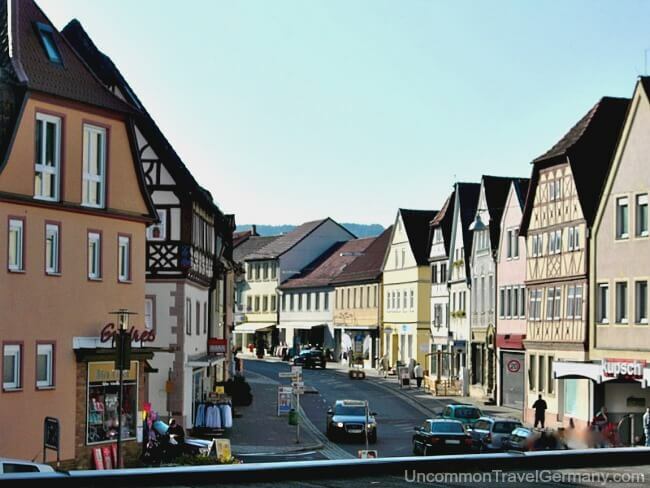 Hammelburg has quite a number of good places to stay; some right on the town square, and others a short distance away. 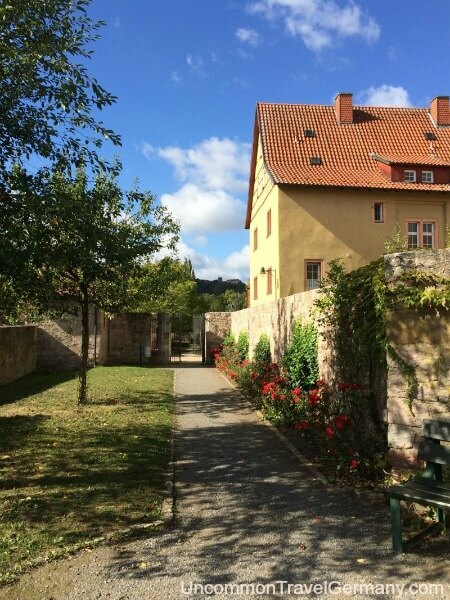 I've stayed at two of the hotels in Hammelburg; both were very comfortable and convenient, and I would recommend either of them. They both have high ratings from other travelers. 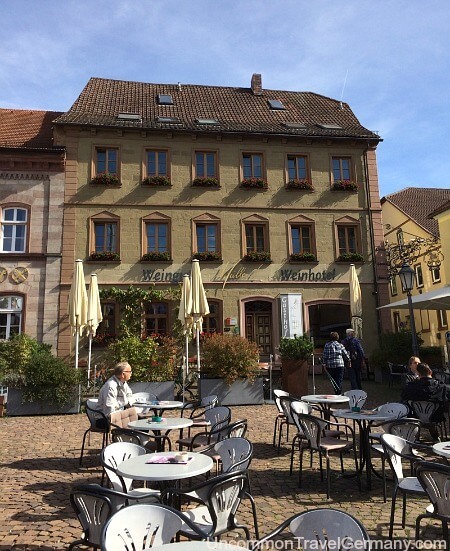 On my first visit, I stayed in a pleasant, old-fashioned hotel right on the Markt, the Weinhotel Müller. 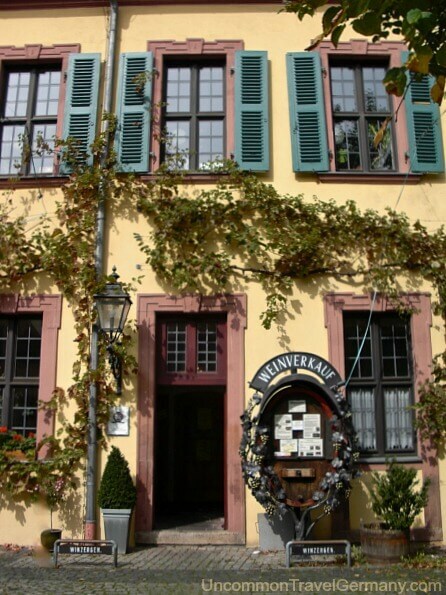 The hotel is quite old, but well-maintained, quiet and clean (of course, it's Germany). The owners were friendly and the price was very reasonable. There was an excellent restaurant in the hotel, homey and comfortable, where the delicious breakfast buffet was also served. For more info and booking, see Weinhotel Müller. On another visit, I stayed at the Hotel Kaiser; it's on the outskirts of town, but only a ten minute walk to the town center. This hotel was also very comfortable; very modern rooms and a wonderful and generous breakfast in the downstairs dining room. 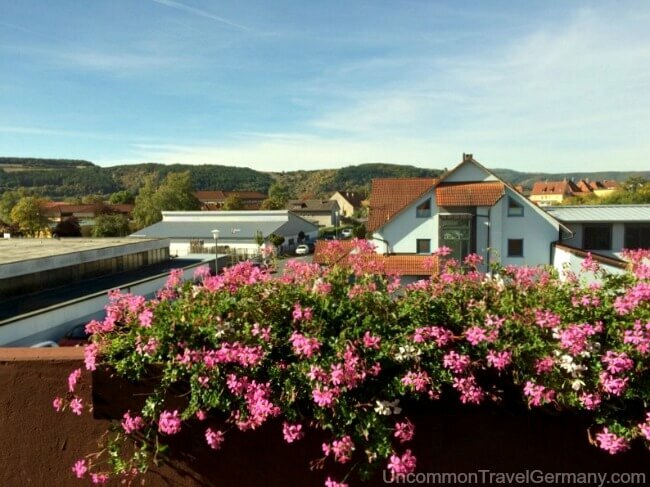 We had a room with two balconies, overlooking the pretty Franconian countryside. One cool thing: The Hammelburg Ost train stop is immediately behind the hotel. You literally walk across the tracks and you're at the hotel; no catching a taxi or hauling your luggage into town. Trains running in and out of Hammelburg stop here as well as at the Hauptbahnhof, which is about a fifteen minute walk to the town center. Great if you're traveling without a car, though they have parking for cars as well. But we didn't hear the trains, so it was quiet as well (our room was on the opposite side of the hotel). For more info and booking, see Hotel Kaiser. Another highly-rated hotel is the Hotel Stadtcafe on the Markt. It's a pretty hotel with a cafe/bistro on the ground floor. We enjoyed their ice cream sundaes and homemade pastries - yum! See Hotel Stadtcafe for more info and booking. The first mention of the town was in 741, and Charlemagne gave the town to a church entity in 777 A.D. 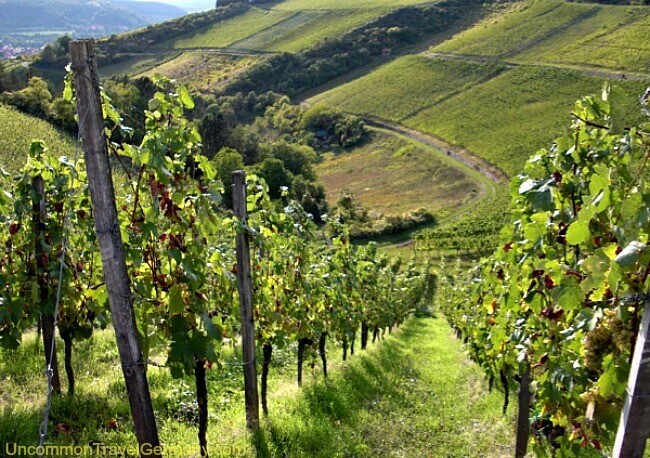 Even then, it was known as a wine-producing area. 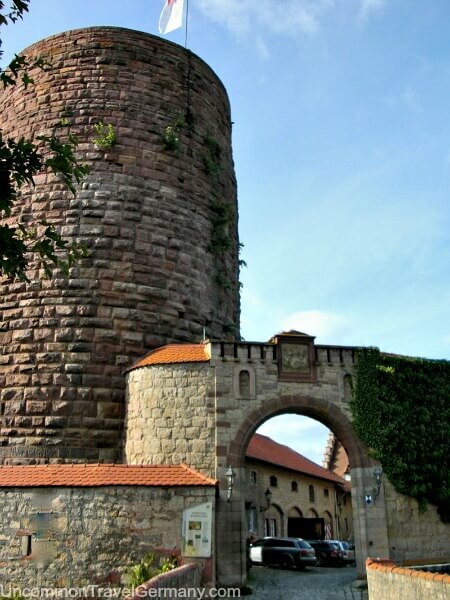 Saaleck Castle on the outskirts was built in the 12th century to guard the town, which had a strategic location on a ford of the Saale River, and was at the crossroads of two important trade routes. 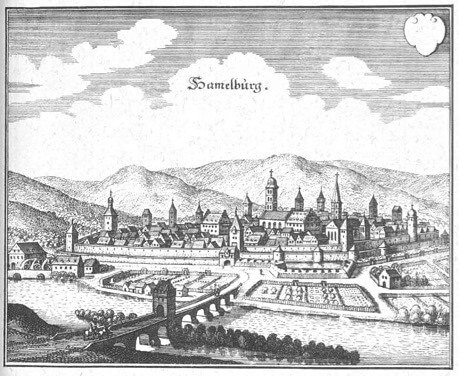 Hammelburg was caught up in German's religious struggles in the 16th century. The citizens chose to follow Martin Luther's teachings in spite of being in a Catholic jurisdiction, but were later forced to become Catholic because of the faith of their rulers. 120 Protestant families moved away in 1604 because of this. Starting under Kaiser Wilhelm, a military camp was created near the town and was used as a training center for the German Army. During WWI and WWII, the camp was used to hold POW's (Stalag 13C and Oflag 13B in WW2); later the camp was used to house refugees from the east. 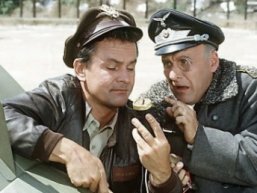 See the history of Stalag 13 for more details. 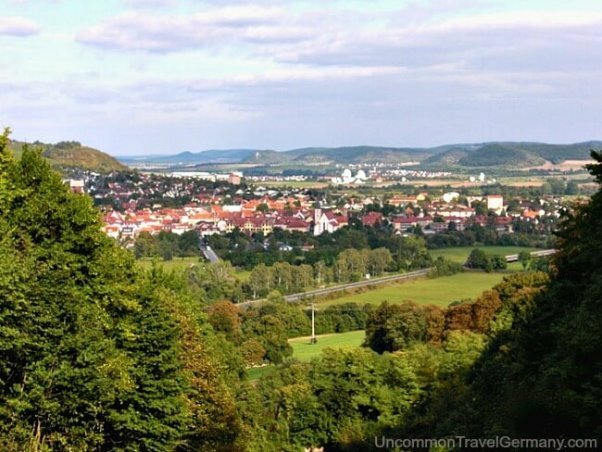 A local legend tells the story of how Hammelburg and the surrounding villages got their names. Long ago, when the Great Flood covered the earth, Noah's Ark came to rest on a mountain top in what is now Germany. When the waters receded, Noah said (in German) "So den Berg haben wir" (so this mountain have we). 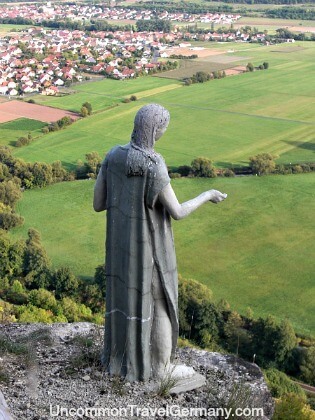 This mountain is now called Sodenberg and rises above the valley where Hammelburg lies. Nowadays, a cross on the Sodenberg marks the spot where Holy Killian preached Christianity to the people in 680 A.D.
Hammelburg is only about 50 miles (80 km) east of Frankfurt, though it feels like it is deep in the countryside. 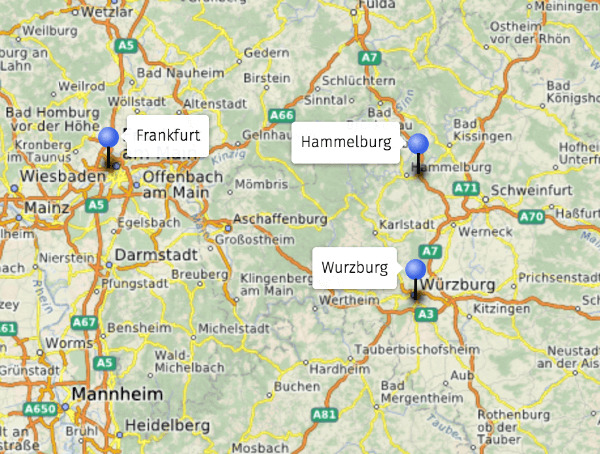 With a car, it would be a fairly short drive from Frankfurt; it's also easy to reach by train. The town is on a branch line which connects with the main lines via Gemünden to the south or Schweinfurt to the east.